The following is a partial list of confirmed Matthew Gollub speaking events scheduled for this calendar and school year. If you wish to piggy-back a speaking date on the day before or after an event listed, please inquire soon as days sometimes fill in faster than we can indicate here. If you would like to preview Matthew at a school in your area, kindly contact the host school and ask permission to watch an assembly. 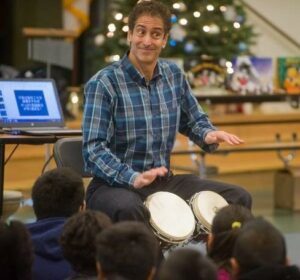 4/2/18 Bascom Public Library, San Jose, CA, story telling and book signing. Open to public! 7/27/18 Crocker Art Museum, Storytelling and book signing for “Animal Party / Fiesta de los animales” bilingual children’s summer event. 9/29/18 Fairy Tale Town, Sacramento, CA. Thrilled to be invited back to tell stories, entertain, and emcee for the day at their fabulous annual children’s book festival!